Oh Day Seven! I can’t believe that we’ve now been on the island for 7 days. For today, at first we planned on hiking La Perouse Bay. We packed our sneakers, lunch, and extra clothing. We actually got out of the condo right at 9am. We’re really getting better at this. First order of activity was to rent snorkeling gear. I’ve rented from Boss Frog’s and Snorkel Bob’s before, and I knew that I saw them around somewhere in Kihei. However, the very first one I saw that was nearest to us was Auntie Snorkel. 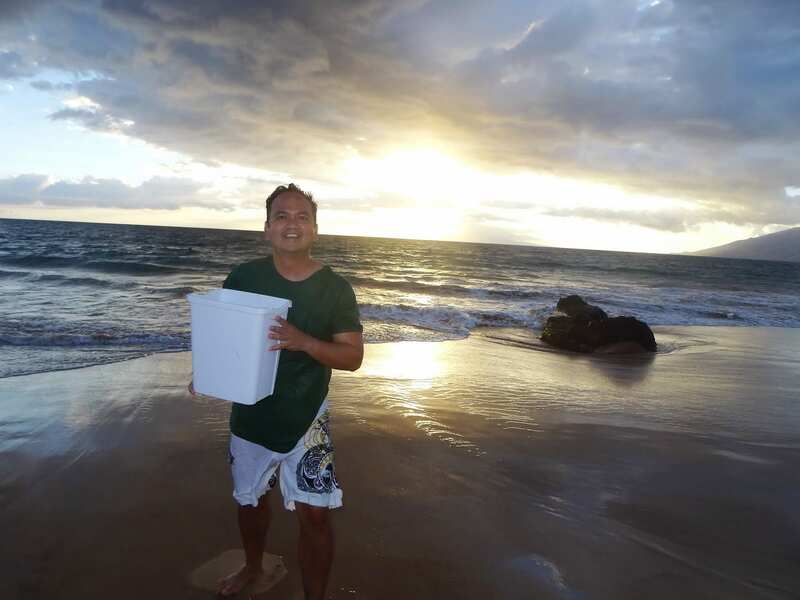 The guy suggested the following local spots, Ahihi Bay, Makena Landing, Po’olenalena Beach, and of course, right across from the condo, Kamaole Beach III. After 5-10 minutes of getting our gear, we were off. Since we’ve not explored anything past Makena Beach, I decided let’s go further South first and make our way back. Further South in this case was La Perouse Bay. The road went from paved, to unpaved, to rocky, and the kids had a Road to Hana flashback. We parked where most cars parked. It started to rain for a bit, you the rain that lingers for about 5 minutes or so. The kids asked if we could go to a beach with sand instead. So I turned around and headed back. It was, however, very interesting to see goats roam around the rough roads near La Perouse. When a beach is labeled “secret” and it’s on the map, it’s really not a secret anymore, is it? I wasn’t really sure if this beach was the secret cove they were talking about. 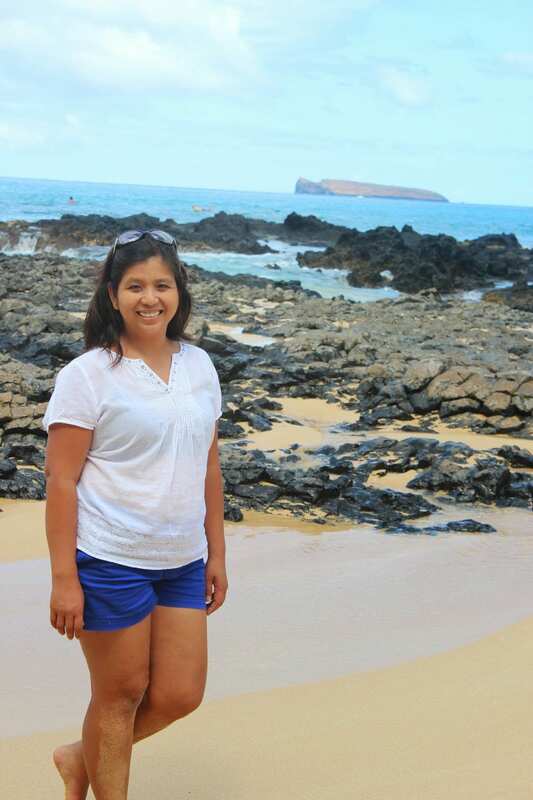 It’s located a few miles away from La Perouse, and Ahihi, it was the one right after Makena Beach. I saw a shoreline access, it was a tiny path…no more than 15-20 feet, and then bam…we were at the cove. Waves were crashing, not really a big place to snorkel, but truly a picturesque beach. This area was sandwiched between 2 large homes. There were two little beach coves where our kids played. There were also rocks off to the right that leads you to a front row seat where you can watch surfers catch a wave or two. We stayed here for about an hour, ate a very early lunch. 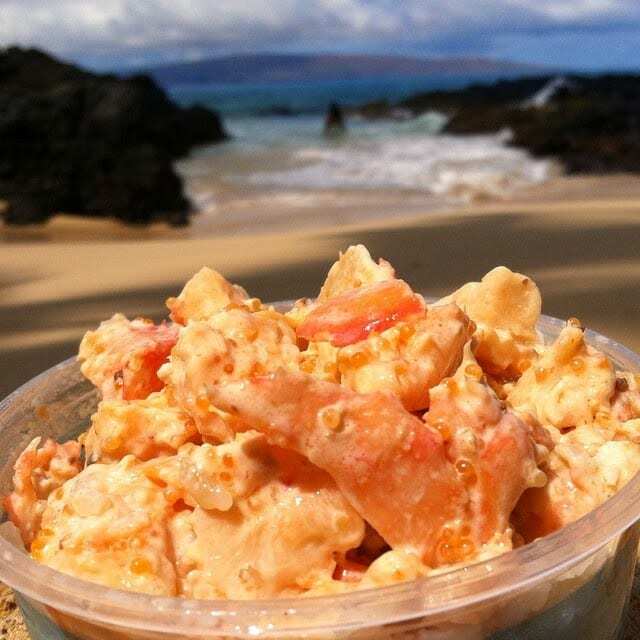 I took out the poke I purchased from Tamura’s last night – Wasabi King Crab Poke. These were big, thick, chunky King Crab meat – so fresh and sweet! Good enough for a quick lunch. We had chopsticks and soy sauce and we were good to go. 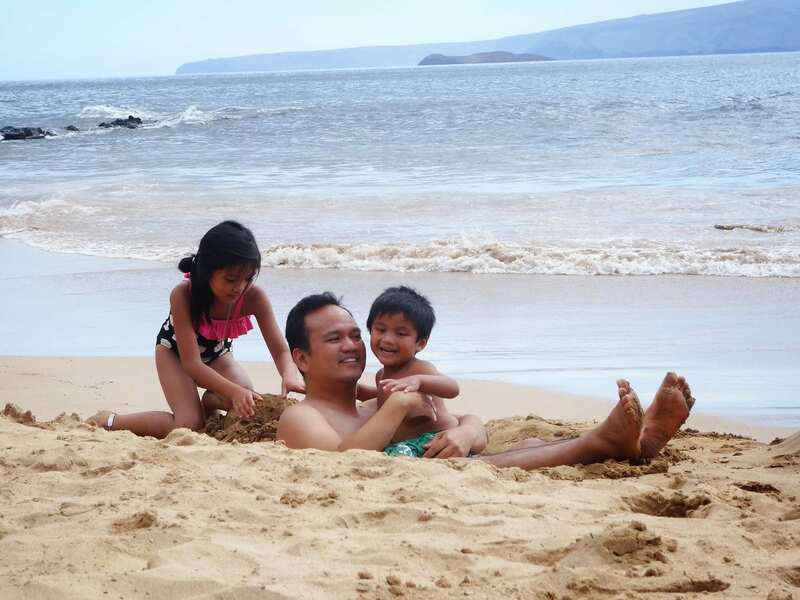 After leaving the not-so-secret cove, we decided to check out Makena Landing. The guy at the snorkel store mentioned that you have to swim 100 yards to see the real action. I think we could do that. First thing I noticed upon arriving at Makena Landing, there were a lot of locals. I actually like that. The other one I noticed, there were facilities (showers, restroom)…that’s a good thing. 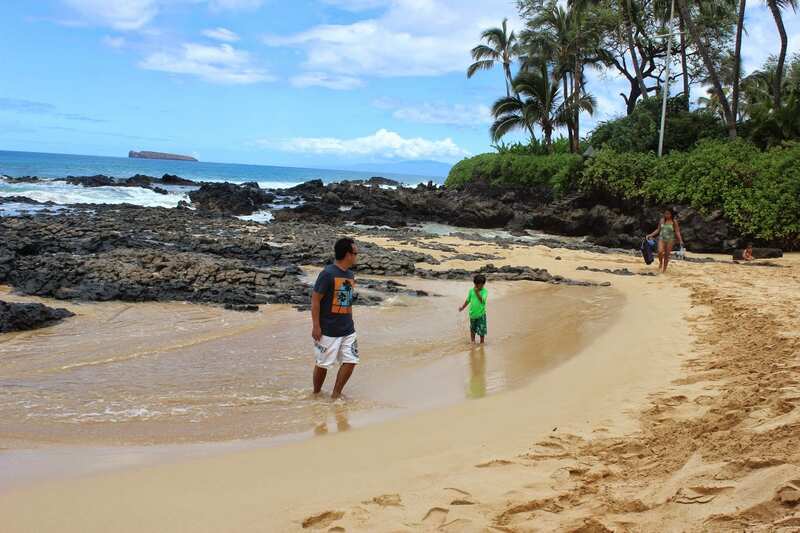 The entrance to Makena Landing’s Beach wasn’t that wide to begin. It’s not a place where Ethan could skim board. But there were decent kid-friendly waves so the kids got to ride their boogie board. It was cool to see Ethan help his little brother ride the body board. Ethan and I tried to swim for about 100 yards, I must have seen a fish or two. So we decided to just stay and play close to the beach. 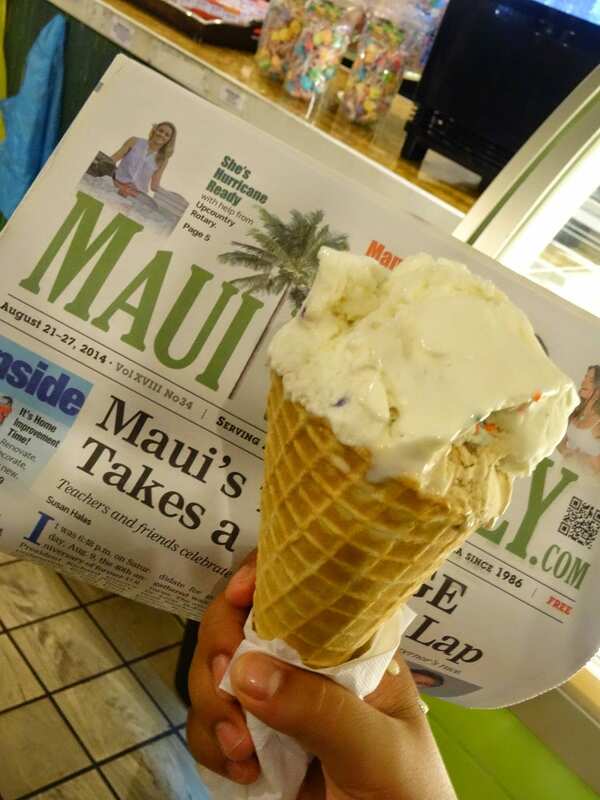 place to try it than here on Maui. Costco. All I did was chop the can of pineapple using a mini-food processor. The chopped pineapples, and juice went in a mixing bowl. I don’t measure, I just guesstimated. Again, these items were in the pantry (free and included by the condo owner). 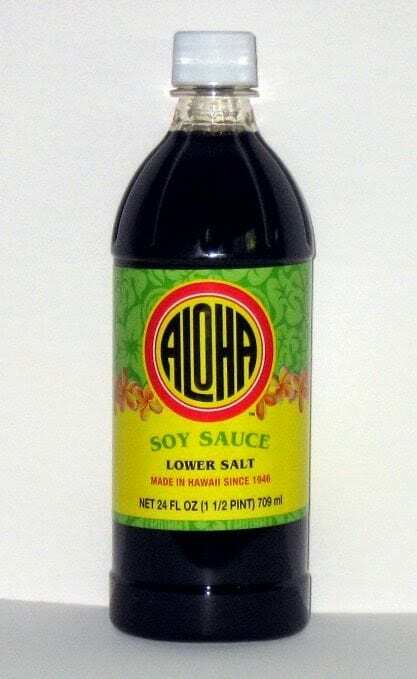 I added low-sodium Aloha Shoyu sauce, red wine vinegar, a couple of ketchup packets, powdered ginger and garlic (from the spice rack), salt and freshly ground pepper. 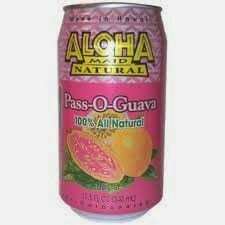 Oh I might have broken the huli-huli chicken rules, but went to the fridge, I saw a can POG juice – Passion Orange Guava. Why not??? I make my own kitchen rules 🙂 So there, that’s my quick, down, and dirty recipe. I planned to let this absorb the flavor and let it rest inside the fridge and pray I got it right. conditions just wasn’t that great for snorkeling. It was more of body boarding, or surfing kind of a day. That was just fine. Most of that afternoon was spent doing exactly just that, exactly what the kids wanted to. Evan and Caitlin dug a 3×3 feet hole in the sand, and invited me to go in the hole. I gladly obliged. It was actually quite comfortable, it was like sitting in an empty bucket with the perfect view of the ocean in front of me. Madison, on the other hand, worked on her skim boarding, while Ethan enjoyed body boarding. 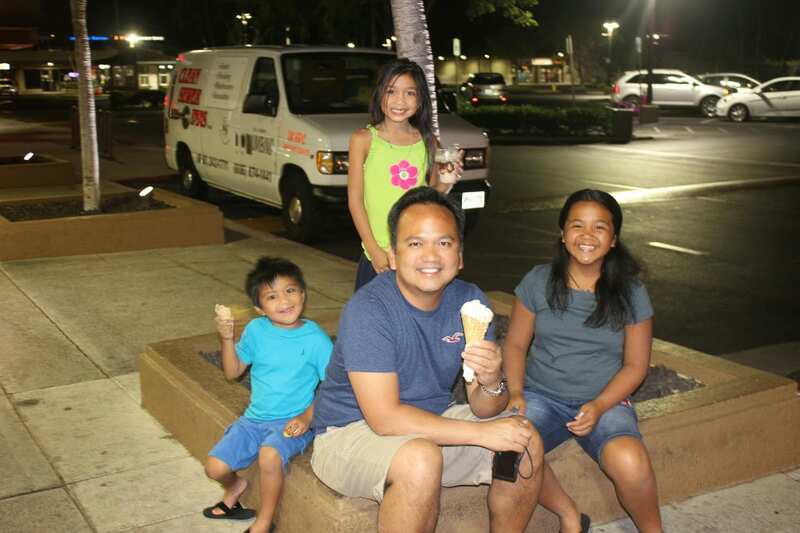 Nancy had fun just watching her 5 kids (me included) play and we had the grandest time in Kamaole Beach. After 2-3 hours of beach play, Ethan and I stayed in the water, while the rest of them went to the pool. After over 4 hours of marinating the chicken, I brought the bowls of marinated chicken downstairs. The condo has access to 4 portable grills located right next to the pool. With a push of a button the grill was ready to go, flames and all. I kept the lid closed first, no chicken yet, and waited for the temp to rise to about 300 deg. While waiting for the temp to rise to 300, I scooped the chopped pineapples out of the bowl, and I tucked them under the skin of each chicken thigh. 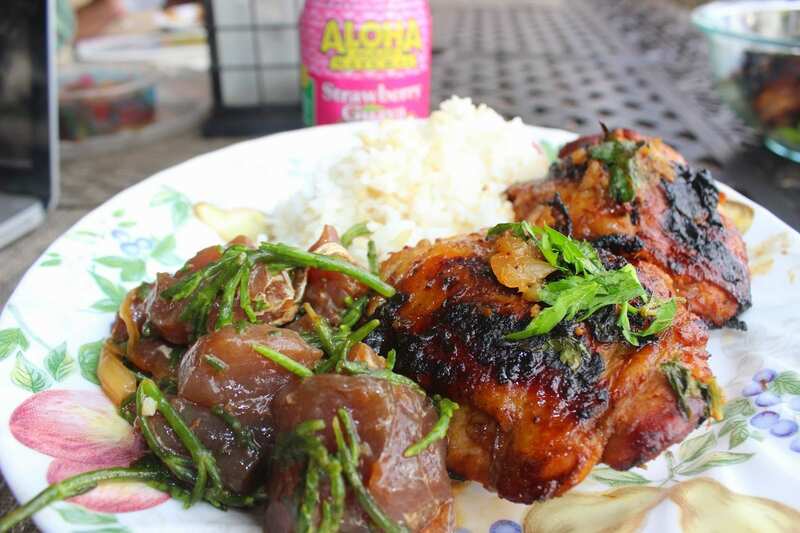 My hope was for the pineapples and its juices and flavors to permeate onto the skin and meat. basted. After 30-40 minutes or so, after seeing a good chargrilled look on the skin, it’s time to unveil the chicken to my family. 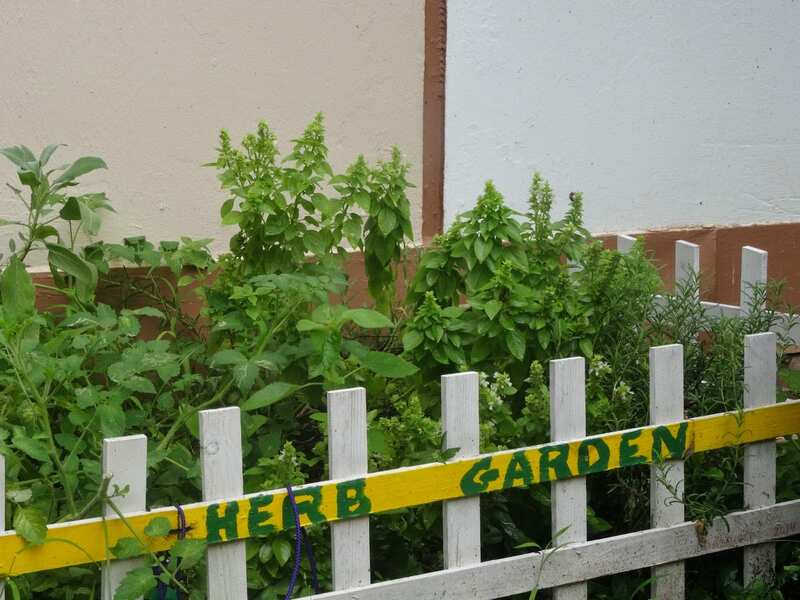 I passed by the herb garden and picked fresh parsley. I washed the parsley, chopped it, and used it to garnish the chicken. The family had prepared our dinner table right on the lanai overlooking Kamaole Beach. Aside from breakfast (we’ve been eating breakfast here since it takes us forever to get ready in the morning, this was probably the first time we’ve prepared dinner). 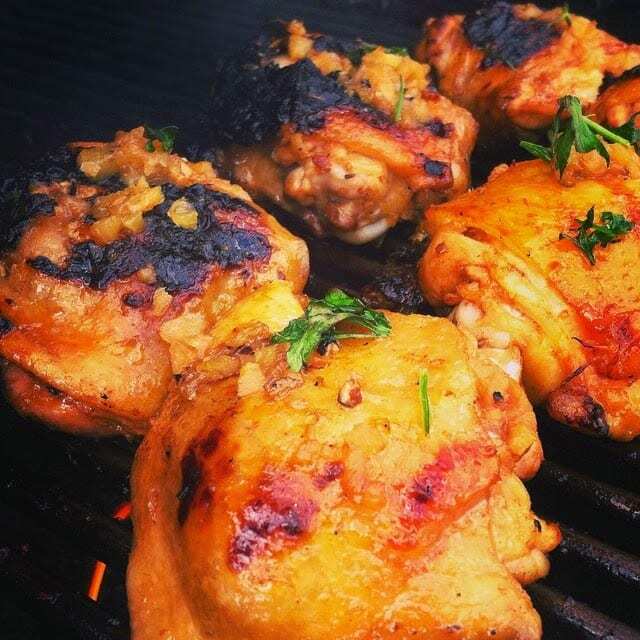 Daddy got rave reviews on his first attempt to grill Huli-Huli chicken. I was so glad i tucked the chopped pineapple under the skin. The sweet taste was evident on the chicken meat. The skin was nicely charred crispy. On the side, not to be outdone, was the 3rd Poke I purchased last night from Tamura’s. It was the Ahi Hot Shoyu Poke. It was a perfect contrast to the sweetness of the chicken. Also on the side was kimchee we purchased from Foodland the other day. For our drinks, we had ice cold bottled water, and a variety of Aloha Maid canned juices. That was our dinner….family, lanai, overlooking the sun that was about to set. It just couldn’t get any better than that…until…. 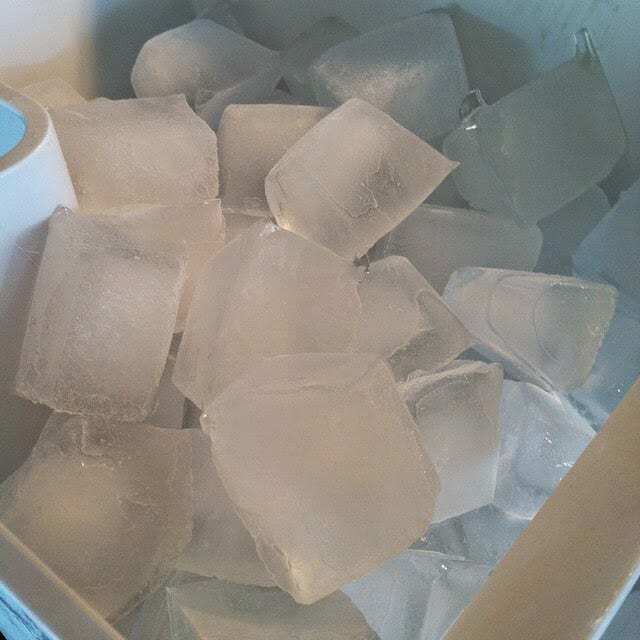 My ALS Ice Bucket Challenge. There you go….Day Seven….done!!! We have 2 more full days left, and you can bet we’re going to make the best of it. Aloha and mahalo for reading our journey.